THE GRAPHITE PORTFOLIO - The second in Robert Taylor's series of limited edition pencil drawings. Crucial to every squadron in the RAF were the unsung heroes of World War II - the ground crew. Without the vital support of these dedicated men who refuelled the aircraft, rearmed them, maintained them and kept them flying, the pilots and aircrew would, quite simply, never have got into the air. Robert Taylor's drawing VITAL SUPPORT shows ground crew bombing up a Mosquito of RAF Bomber Command. In addition to the ten pilots and crew who have signed the Limited Edition, each print has been individually hand matted to include an ORIGINAL fragment of Madapolam Fabric that belonged to de Havilland 98 Mosquito Prototype W4050. 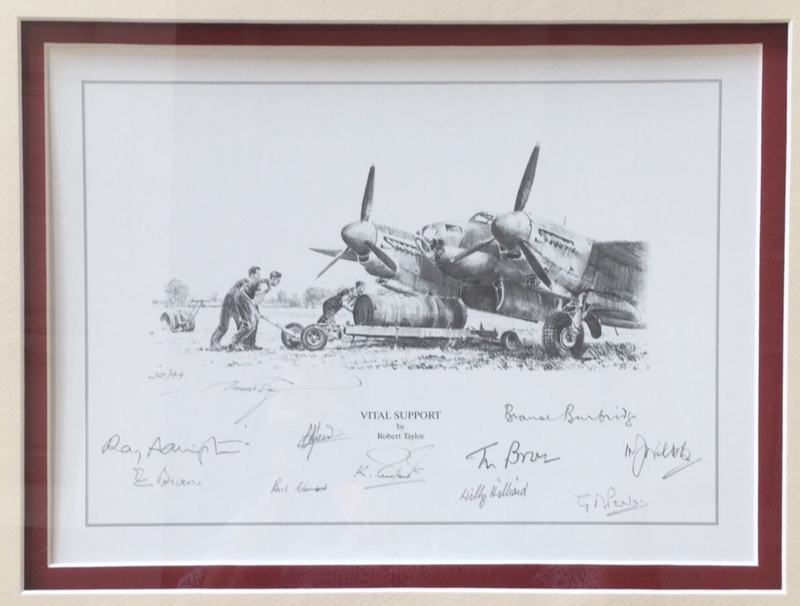 Also matted are the ORIGINAL signatures of two of the greatest Mosquito pilots of all time:.